Imlay is an unincorporated town in Pershing County, Nevada, United States. It has an elementary school, a general store, a post office, and a trading post. As of the 2010 census the population was 171. It is a nearly abandoned railroad town, named for a nearby mine or for the civil engineer who surveyed the town circa 1907. Its most notable feature is a series of strange buildings called Thunder Mountain Monument. These structures were built as a monument to Native American culture by a World War II veteran who called himself Thunder. Michael Feldman's Whad'Ya Know? public radio show featured Imlay as the "Town of the Week" on its December 5, 2009, show. They mentioned Thunder Mountain Monument as one of the premier draws to the area. 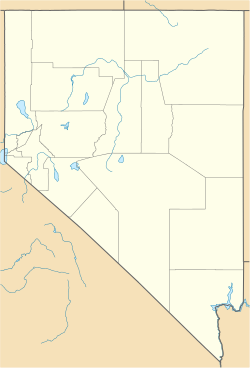 Imlay is located in northern Pershing County, Nevada, along Interstate 80, with access from Exit 145. The town is 34 miles (55 km) west of Winnemucca and 40 miles (64 km) northeast of Lovelock. The Humboldt River flows past 2 miles (3 km) to the north, near its inlet into Rye Patch Reservoir. According to the U.S. Census Bureau, the census-designated place of Imlay has an area of 34.5 square miles (89.4 km2), all land. ^ "Pershing County Code - Chapter 2.44: Unincorporated Town of Imlay". Sterling Codifiers. Retrieved January 31, 2017. ^ a b "Geographic Identifiers: 2010 Demographic Profile Data (G001): Imlay CDP, Nevada". U.S. Census Bureau, American Factfinder. Retrieved January 28, 2013. ^ Basso, Dave (1970). Ghosts of Humboldt Region. Sparks, Nevada: Western Printing and Publishing. p. 40. States that Imlay was named for a mine. Contains 6 historic photos of Imlay. ^ Leigh, Rufus Wood (1964). Nevada Place Names: Their Origin and Significance. Salt Lake City: Desert News Press. p. 27. States that Imlay was named for a civil engineer. ^ "Thunder Mountain Monument, a monument to the Native American People". This page was last edited on 14 January 2018, at 00:04 (UTC).